As the power of the Third Reich engulfs Germany, the List Family, comfortable in the garden of their Nuremberg home, watches and waits ... Or do they? 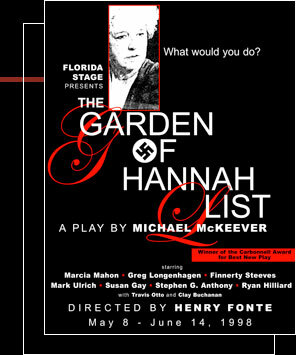 The Garden of Hannah List explores how individuals react when faced with overwhelming evil, and how the human spirit can prevail or falter when confronted with the choice between right and wrong. "McKeever's play consistently surprises and compels with plot twists that bring a fresh perspective to a subject that would seem to have exhausted all possibiblities for originality." "Some plays grab audiences from the start and hold them to the end. So it is with The Garden of Hannah List." "McKeever's strategy is to play different moral points of view against each other, and the effect is breathtaking." "An intriguing, sometimes funny, thought-provoking yarn."